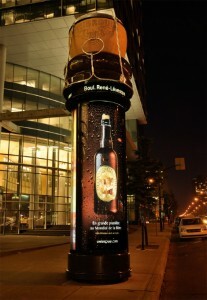 Montreal-based ad agency Tam-Tam\TBWA, in collaboration with its client Sleeman Unibroue, developed this out-of-home piece in preparation for the launch of the brewery’s new product, Blonde de Chambly. During the 2010 Mondial de la bière, an international beer festival in Montreal (held this year June 2-6) a MegaColumn close to the event grounds is topped with a giant cork and muselet, the wire cage that secures the cork in a bottle − two icons of the 750 mL format of high-end Unibroue beers. The message invites beer lovers to come and taste the new product at Le Mondial de la bière, just steps away. The column and the extension will stay up until June 25. Production was by Trans-Optique inc., Pointe-Claire, Que., with media by Carat, Montreal. This entry was posted on Tuesday, June 8th, 2010 at 08:31 @396 and is filed under Scuttlebut. You can follow any responses to this entry through the RSS 2.0 feed. You can leave a response, or trackback from your own site.